October 31, 2013 By Tina M 3 Comments This post may contain affiliate links. Read my disclosure policy here. Happy Halloween! Halloween is almost over, which means it’s about time to take down my eyeball wreath and replace it with a fun fall wreath! As a disclaimer to this post I have to tell you that I have no special skills in the crafting department, so don’t worry if you didn’t get your degree in “craftology,” this one is do-able for all us novices. 🙂 After I finished it last night, I brought it upstairs to show my husband and sadly the first words were, “Did YOU make that?” Haha. There’s your proof: Anyone can make this. I realize some of you are probably perfectionists, so it may take 20 or even 30. I’m only sort-of sorry about that. 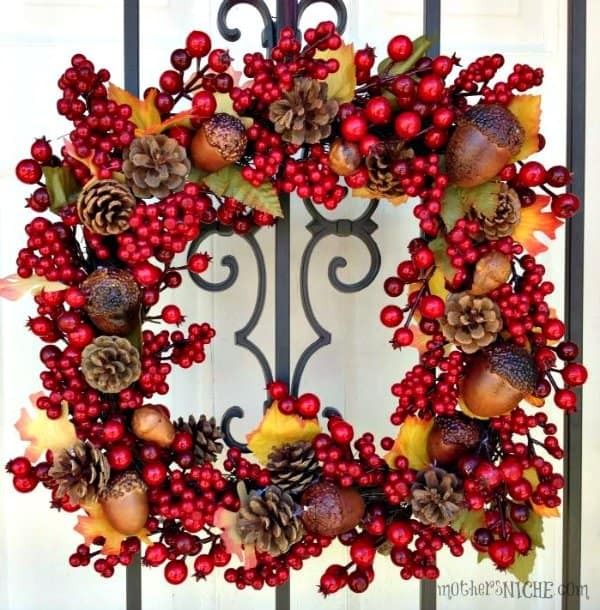 Find a cranberry wreath online or from a local craft store. I got mine from Oriental Trading. I had no idea until like a month ago that Oriental Trading has crafts and home decor! Seriously? Awesome. At first I was regretting ordering it because then I was like, “awe crap, now I have to come up with something to make with it,” but now I’m proud of myself for being brave because I’m totally crushing on my new wreath! 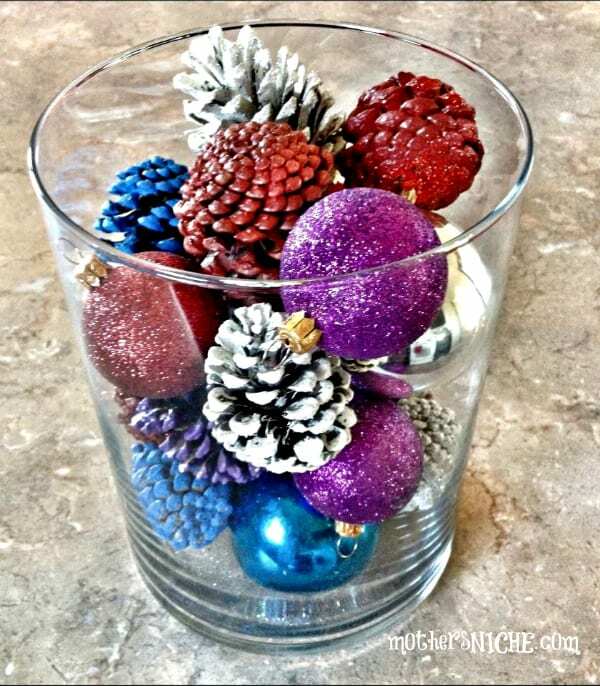 If you live somewhere near pine trees, you can go on a wild hunt to find some, or you can buy them online or at a craft store. Tell your husband you have something fun planned and then take him on an adventure to help you find pine cones. He’ll love it. HA! 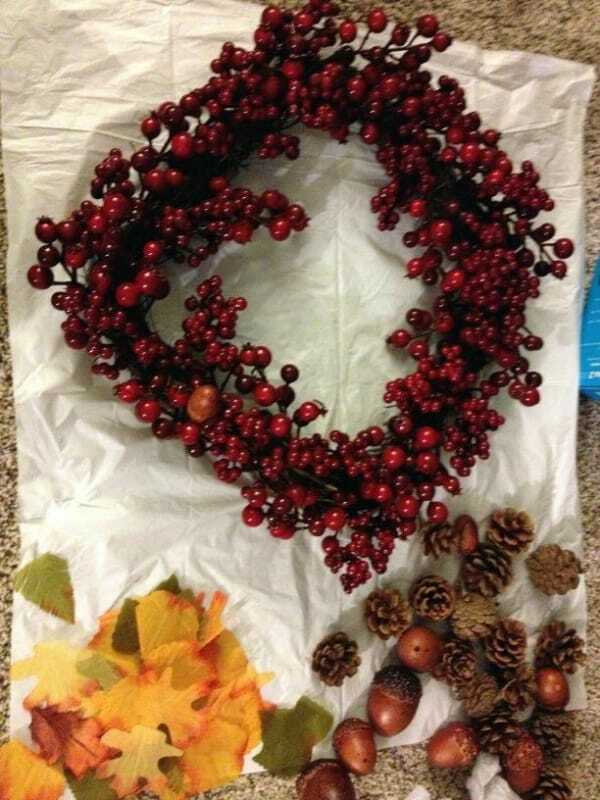 The ones on my wreath came from Oriental Trading. Please, no one bully me and tell me it’s ugly because I’m like 100% satisfied with how this turned out. And a little shocked. Are you catching on yet? I like easy. A lot. This one is as easy as they come. And the best part? 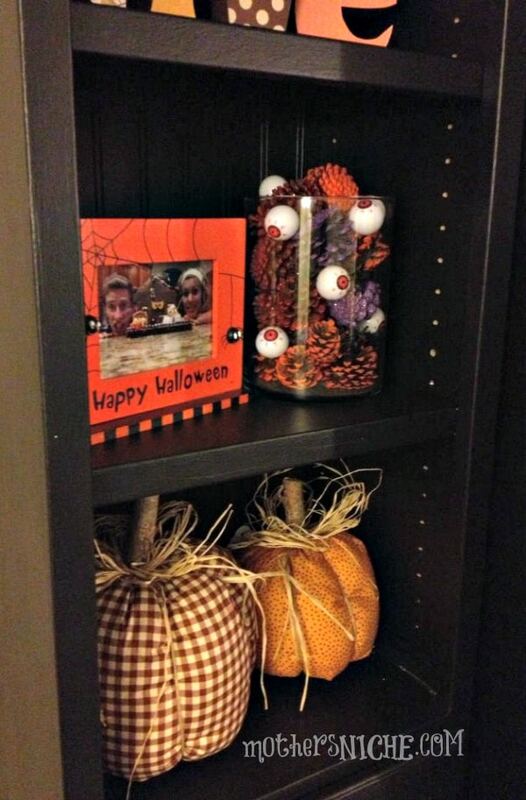 You can make this one work for all seasons and holidays. 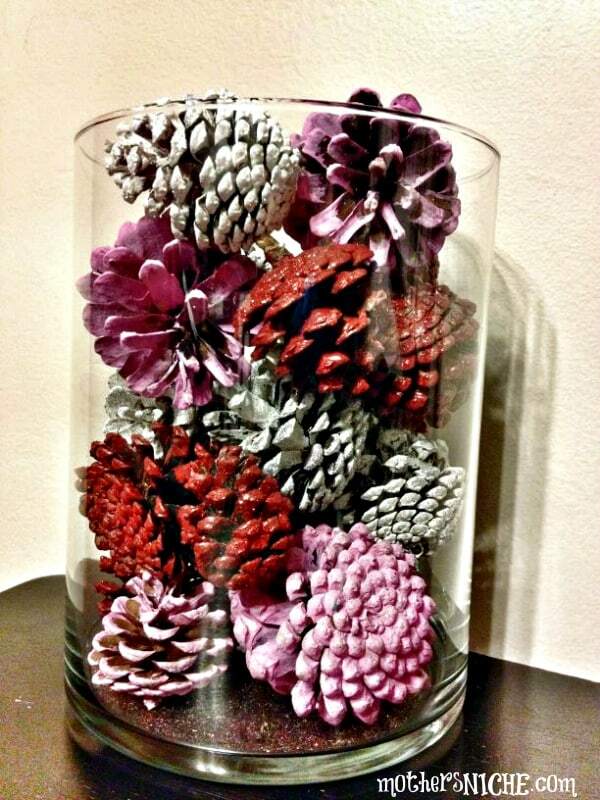 The dear pine cone wants to be part of our lives year round, not just Fall. And the dear pine cone is cheap, so I agree. 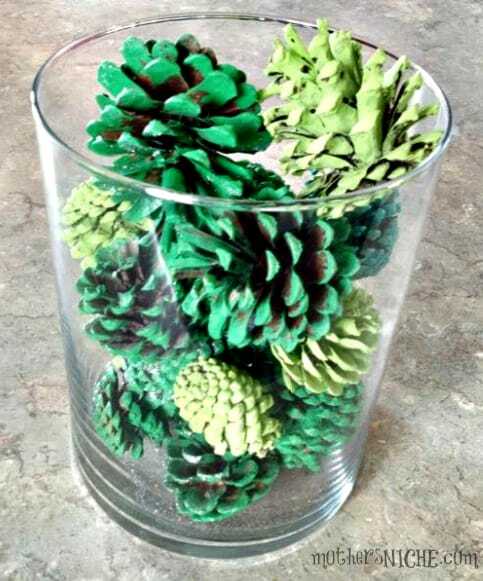 Step One: Paint pine cones. Step Two: Throw them in a jar, or vase or…wherever. I got I large round glass craft jar from Walmart for like $5, but now I’m kind of having buyers remorse and wishing I got one of these because they have lids! But oh well, the one I have will do just fine for now. So pretty and the colors take you right through all of the holidays! Stopping by from the Pin It Party. 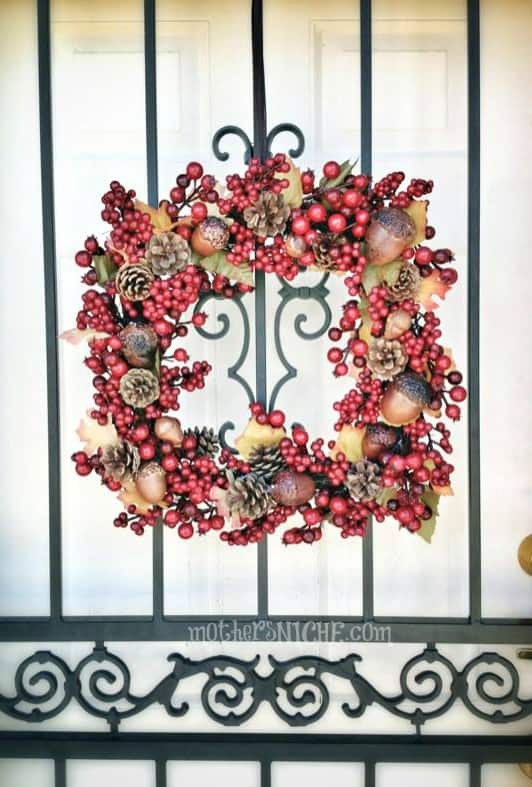 Yes, I’m living that I don’t have to make a new wreath for Christmas! Thanks so much for stopping by!